A while back I wrote an article examining if push-ups are harder for tall people. I concluded that push-ups are in fact harder for some people, not because of their height, but because they lack strength. The sooner people accept this fact and stop making excuses to stroke their ego the sooner they can work towards getting stronger and being able to do more. Writing that article has grounded me somewhat and forced me to re-evaluate my own strengths and weaknesses. Despite bench pressing regularly I struggle to perform a high volume of proper form (chest to ground) push-ups. Step out of my comfort zone, prepare myself for some work, pain and sweat. 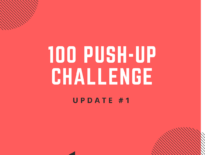 I chose the second option and set myself a challenge to complete 100 push-ups (proper form) consecutively. I’m going to use this blog as a way to keep myself accountable and to (hopefully) inspire others. The aim is to post progress articles at the end of each stage to document my journey until I’ve reached my goal. 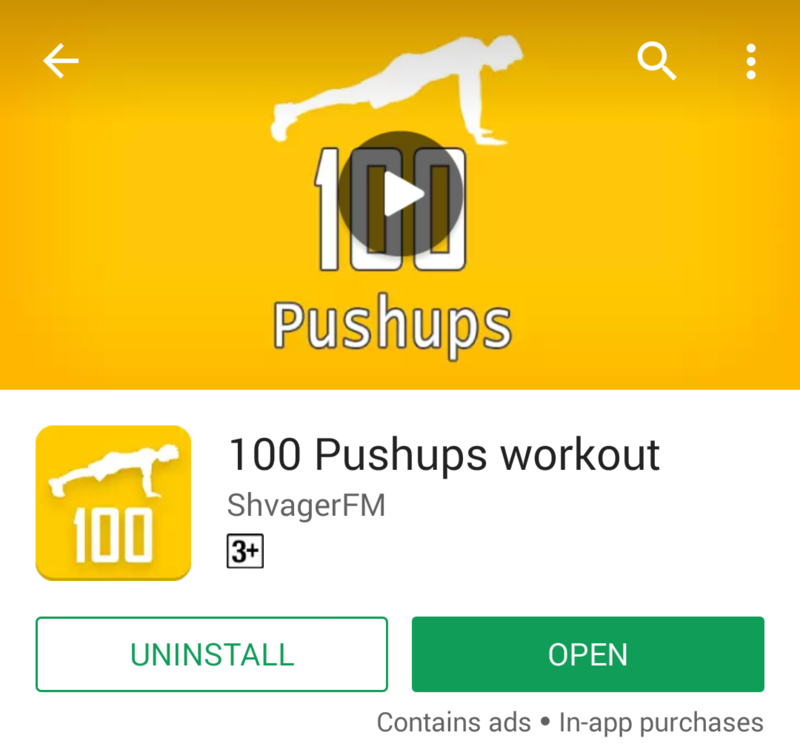 To achieve this lofty goal I’m going to use an android phone app called 100 Pushups by ShvagerFM. This app is completely free and is also available for apple users under the name ‘100 Pushups Be Stronger’. “If you start training on this program you can push-up 100 times in a row in 6-10 weeks”. That seems reasonable and realistic. 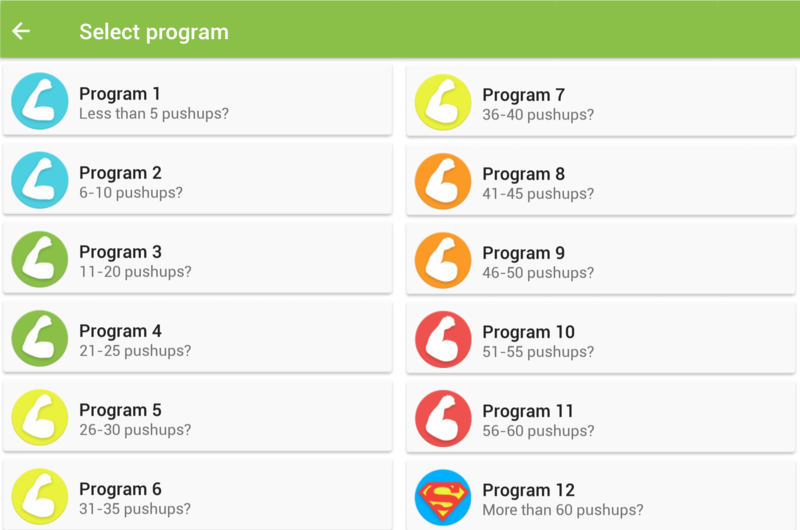 The app has 12 different programs to help you reach 100 push-ups depending on your existing strength level. 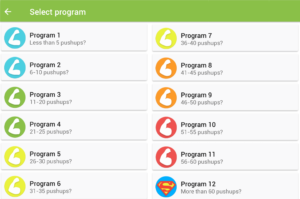 I’m going to attempt this program doing traditional push-ups. If you struggle to do regular push-ups then start this program doing push-ups on your knees. This will no doubt build up your strength so that you can do push-ups off your toes. 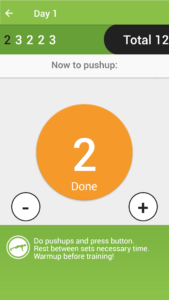 Before selecting a program the app requires you to do the maximum number of push-ups you can in a row. This is where you need to be honest with yourself. Doing half push-ups or starting out normally then dropping to your knees is only cheating yourself. Your maximum number of push-ups determines which program you start. 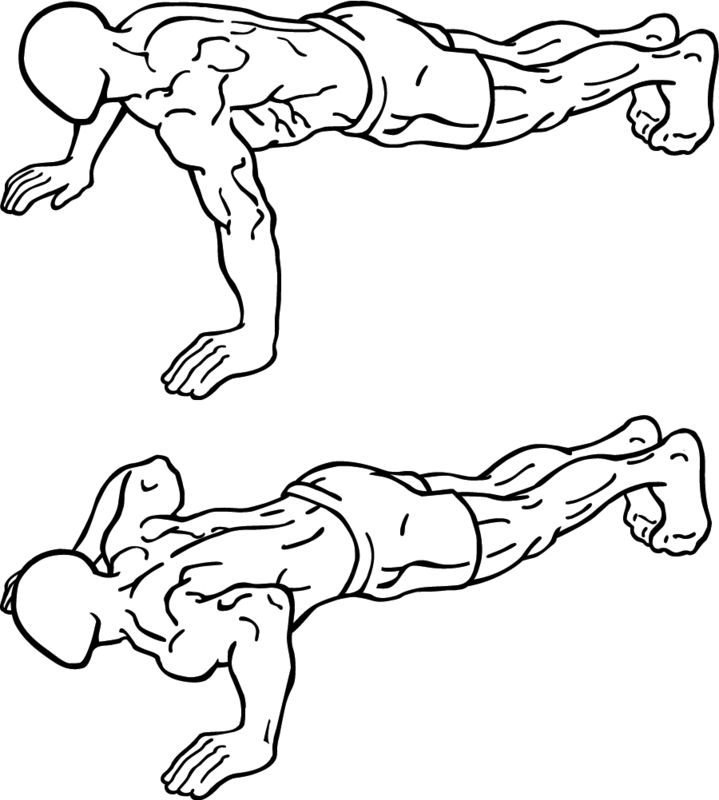 Example: if the maximum number of push-ups you can do is 12 then you start from Program 3 (11-20 push-ups). I’m going to start at Program 1 and work my way through all of the various programs. I want to see if getting stronger to do more push-ups will translate into strength to do other lifts at the gym. Between workouts you must have a minimum of 1 day rest and after 3 training sessions you must take a 2 day rest. 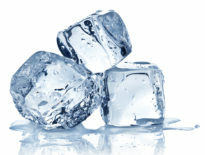 If you are unable to complete a training day completely, take a break for 2-3 days and repeat. 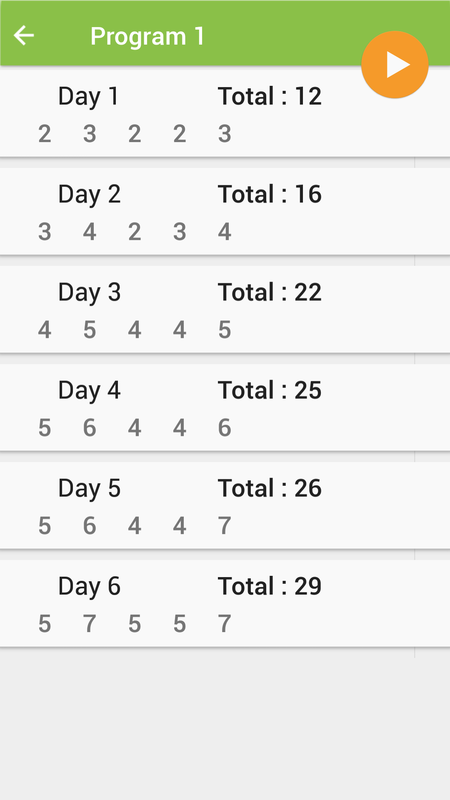 When you complete a full cycle (program) take at least 2 days rest and move on to the next program. Repeat until you get to the last program (60+ push-ups). Once you complete this program, take a 1 to 2 day break and attempt to perform 100 puh-ups. 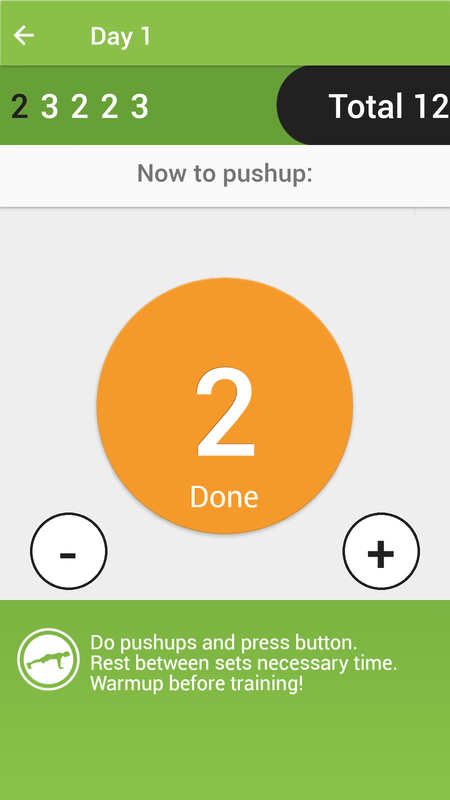 Prior to starting each days push-ups the app runs you through a series of warm-up exercises. Once the warm ups are complete you jump straight into the first round. 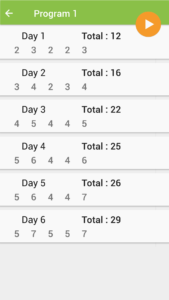 Below is a screenshot of the app interface for round 1. 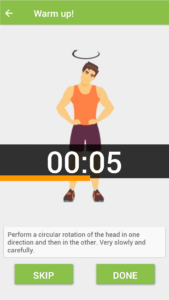 For each round the number of push-ups you need to complete is shown in the orange circle. Once you complete the round, press the circle and the app gives you a countdown timer to rest before the next round. Now that I’ve outlined my plan it’s time to get to work. Stay tuned for an update article once I complete Program 1. If you are going to give this this a go too, good luck and let me know how you go.